Ulta, the largest specialty beauty retailer in the United States, offers guests a premier beauty destination for makeup, fragrance, skin care products, hair care products, and salon services. The company strives to provide all things beauty, all in one place offering more than 20,000 products from over 500 beauty brands across a variety of price points. Ulta Beauty is recognized for its commitment to personalized service, convenience, and a seamless omnichannel experience. Founded in 1990, Ulta Beauty now operates 886 retail stores across 48 states, and distributes its products through its robust eCommerce site. Ulta Beauty’s commitment to delivering exceptional products and services in its fun and inviting stores is what continues to drive strong brand loyalty with beauty enthusiasts. The Ultamate Rewards loyalty program serves as a way for Ulta Beauty to thank its guests for continuously choosing Ulta Beauty as their beauty destination. Ultamate Rewards members earn points for every Ulta Beauty purchase, which translate into dollars to use in stores or on Ulta.com on any of its 20,000 products. With over 19 million active members, the program continues to grow and evolve as more members spread the word about their love of the brand. Undoubtedly, the Ultamate Rewards program consists of Ulta Beauty’s best guests - they purchase more frequently, spend more, and act as brand advocates. Always striving to increase its share in the beauty market, Ulta Beauty looked to leverage its Ultamate Rewards members to acquire new, equally valuable guests. Because members were already actively referring their friends and family organically, Ulta Beauty decided to invest in a referral marketing platform that would not only reward them for the efforts already being made but would incentivize them to refer better guests more frequently than ever before. For Ulta Beauty, delivering an omnichannel shopping experience to its guests is always a top priority. Because the experience with beauty products is so personal, many guests prefer to shop in-store, giving them the opportunity to experiment with products before they purchase. Ulta Beauty knew it would have to develop a different kind of refer-a-friend program that could serve omnichannel guests and allow them to use their referral bonus in-store or online, allowing new guests to shop in whatever channel they prefer and further encouraging loyalty towards the brand. Ulta Beauty considered many companies to run its refer-a-friend program, but hired Extole as its referral marketing partner due to its expertise in the referral space, as well as its easy to use, always-on technology. Extole’s knowledgeable and hands-on experts provided Ulta Beauty with KPIs and benchmarks from the start of the program, allowing the brand to fully understand its performance compared to others in the retail industry. And, Extole’s powerful reward engine supports in-store redemption, helping to meet an essential Ulta Beauty requirement. Ulta Beauty first launched its referral program with Extole with a small subset of Ultamate Rewards members in October 2015, developing a reward that would incentivize both current members and their friends to participate. When an Ultamate Rewards member refers a friend and that friend joins the program, the friend earns $10 off her first purchase of $30 or more at Ulta Beauty and the advocate earns $10 off her next purchase of $30 or more. 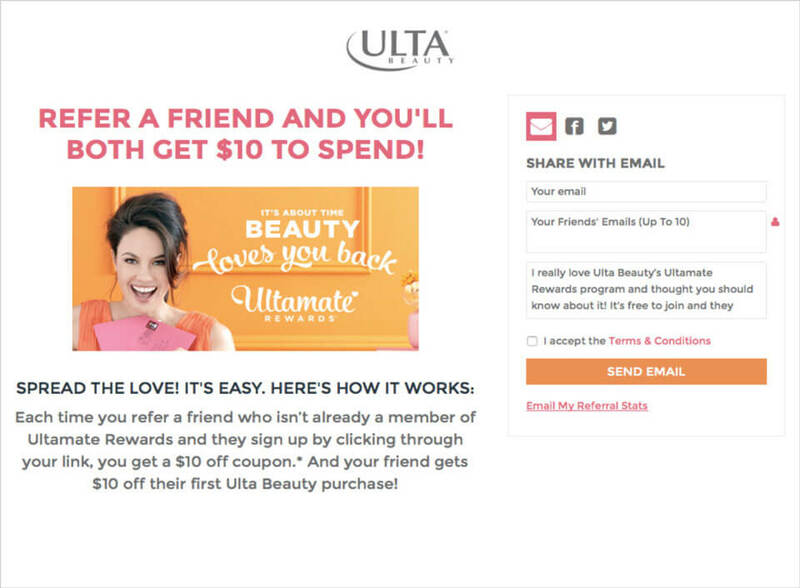 Ulta Beauty makes it easy for advocates to refer their friends, offering share capabilities through email, Facebook, Twitter, or a custom URL. Ulta Beauty worked closely with Extole to personalize its campaign to encourage advocates to share more, and found that the small changes it made to the program during its testing period delivered positive results. Feeling con dent in its new campaign, Ulta Beauty expanded its referral program to all members in early 2016. Since the program’s inception, over 100,000 Ultamate Rewards members have shared referral offers with their friends, and over 27,000 new members have joined the loyalty program as a result, with 10% of all online Ultamate Reward signups coming from referrals. Approximately 70% of Ultamate Rewards members referred by friends redeem their referral reward in-store, highlighting the value that referrals bring to brick and mortar. New members joining through referrals are also on track to spend 50% more than those who joined organically, further demonstrating that referrals bring in higher quality guests. Ulta Beauty’s omnichannel guests are historically its best, and referrals are engaging new guests online and driving them into stores to redeem their rewards. Ulta Beauty’s refer-a-friend program powered by Extole delivers the highest quality guests to join an already loyal following of beauty advocates.